This is a great old-fashioned salad that is guaranteed to bring back memories. My grandmother always served this on special occasions and holidays. 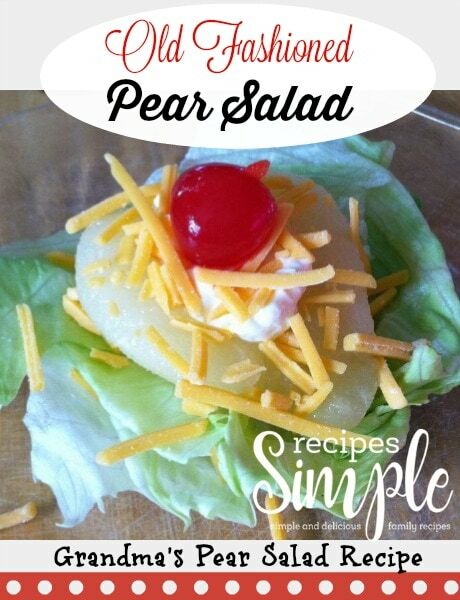 This recipe and photo were submitted by Pauline G. She wrote that she loves making this pear salad for special dinners with friends and family. She said it’s always requested and a family favorite. Lay out lettuce leaf on a salad plate. Place one pear half on top of the lettuce. Add a teaspoon of mayonnaise to the center of each pear. Sprinkle shredded Cheddar cheese on top of mayo. Sprinkle walnuts on top (optional). Top salad with Maraschino cherry half for garnish.